Okay, stop me if you have heard this one. A retired military general recruits a rag tag band of heroes to do what normal people can’t – to kill threats instead of merely subdue them. They work above the law to bring down their targets any way they can. No, they’re not the A-Team. It’s Marvel NOW!’s new Thunderbolts, courtesy of writer Daniel Way and artist Steve Dillon – and it’s nothing we haven’t seen before. Thunderbolts #1 sees General Thaddeus Ross, A.K.A Red Hulk, recruit an elite team of killers: Deadpool, Venom, Elektra and the Punisher, to take down threats in ways that the other heroes wont condone. That’s it. There aren’t any other events that occur in this issue; no real motivations, no hint at what is to come – it’s just plain boring, and doesn’t do well to set up the series to come. The character “interviews” – Ross finding the recruits as they are on their own jobs – set up the meat of this issue, and while the dialogue is good at times, what they have to say isn’t all that interesting. Having Deadpool fight a gang of mimes is suitably Deadpool-y, and the Punisher gets some good time, being suitably brooding and angry, but everything else is just there. Steve Dillon’s art really doesn’t sell the issue either. I don’t mind Dillon usually, but he isn’t working at his strengths this time. The faces look like someone hit them with a frying pan, and in one panel, Ross looks exactly like the Punisher just with grey hair and a beard. I’m a bit upset that Dillon chose to forget Marco Checchetto’s badass Punisher design, and instead went with a more classic approach akin to his previous run on the Punisher, but that’s a minor quibble, especially in comparison to his rendition of Red Hulk. It looks like an abomination, and not in the right way. 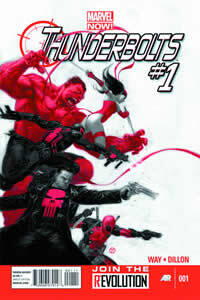 Thunderbolts comes out of the gate very poorly. It’s clichéd, boring and not very good looking . Needless to say, it doesn’t bode well for the rest of the series, and unless the next issue sets up some interesting plot threads, it’s not going to be getting too excited.